Sailing Courses In the Most Beautiful Bay in the World! Puerto Galera offers one of the most beautiful destinations in the World in which to learn to sail, with crystal–clear, warm tropical waters 365–days a year. Light to moderate sailing breezes are almost guaranteed so students learn to sail faster and achieve greater success. 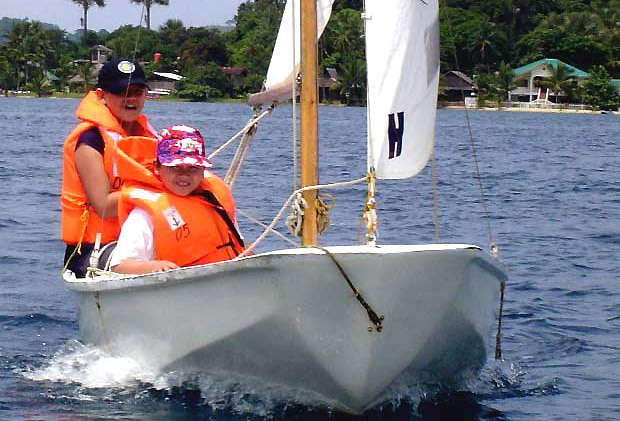 Since 2005 the PGYC has completed more than a thousand sailing courses where students learn to sail, using the unique, made–in–Puerto Lawin 2-person sailing dinghy or the single-hander Optimist sailing dinghy; the PGYC also offers advanced sailing courses aboard the 30-foot Golden Gate 30 keelboat. Our students come from all around Asia and from as far as England, Alaska, Estonia, New Zealand and Australia. Sailing courses cater for students of all ages (our youngest graduate was 8 years old and our eldest so far was 54) and because Puerto Galera is a mecca for all water sports, in between sailing courses students can go scuba diving, windsurfing, snorkelling, jet skiing, kayaking or simply bask in the beauty of Puerto Galera’s mangrove fringed paradise. Dubai American Academy sailing camp; March 2012. 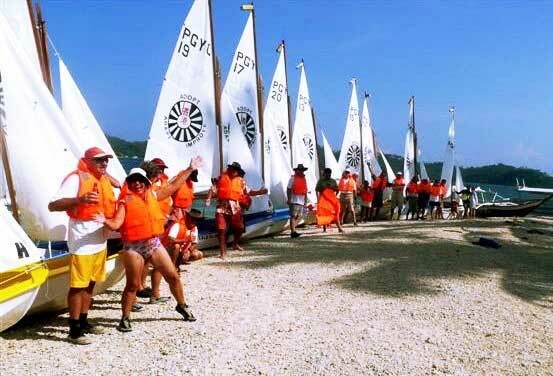 Students of the DAA booked a five day sailing training camp at Puerto Galera Yacht Club. The students from Dubai were ably assisted by our own sailing graduates. From this YouTube video you can see that everyone discovered that sailing is more fun in the Philippines. At the All Souls Dinghy Regatta 2010 ten Lawin dinghies and ten Optimist dinghies were on the water to highlight just how competitive the sailing can be. The “crew” for each boat were mostly local school children who have been through the PGYC sailing courses and have come out champions. See for youself how tomorrow's leaders have earned their medals at a tender age. Sailing courses (Basic, Intermediate and Advanced) cover three days of full time tuition with maximum time on the water. Sailing courses are supervised by a full–time instructor, safety boat and crew. All safety equipment is provided as part of the course fee. With mastery of the wind and boat balance gained with a dinghy sailing course you are probably ready to learn to sail a yacht. The Puerto Galera Yacht Club offers sailing courses, providing sufficient knowledge so that you can master a cruising keelboat or catamaran safely. The yacht club owns and maintains a 30-foot yacht with the primary goal of providing a full skill set to enthusiastic sailors who are thinking that bigger (than a dinghy) is usually more fun. Not sure if you really want to learn to sail? Only in town on a Wednesday? Then come and join a Wet Wednesday Sailing Experience organized by the PGYC. An Afternoon of fun sailing in dinghies in Puerto Galera Bay with a bunch of people with the same idea in mind. Are you already an experienced sailor and just want to rent a sailing dinghy for some day-sailing fun on the water? All proceeds earned from sailing lessons, Wet Wednesday sailing and sailing boat rental go towards funding the PGYC Small Boat Program. The PGYC Small Boat Program, established in 2004, maintains the boats and provides free sailing lessons for all interested Puerto Galera school children. If children want to learn more than just the basics of dinghy sailing then they can continue with advanced lessons for free, provided that they help clean and maintain the boats and equipment. Since 2004 the PGYC Small Boat Program has trained more than 500 Puerto Galera school children in the basics of the sport of sailing. Some of these sailing course graduates have gone on to represent The Philippines as part of the Philippine Olympic Sailing Team; they have competed at international sailing events in such places as Australia, Ireland, Singapore and Macau. 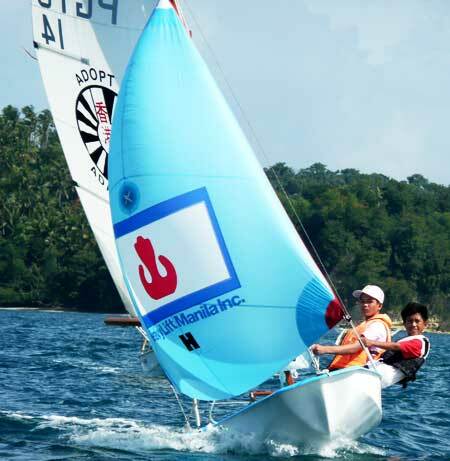 Puerto Galera school children who started sailing under the PGYC Small Boat Program have gone on to win gold, silver and bronze in national and international competitions; some have found careers on yachts located around the World.